​As philanthropist and art collector Michael Audian notes I'm just a temporary custodian of these works. As practising artists we all collect artwork and encourage emerging and established artists through the purchasing of works that resonate with us. This FREE exhibition will celebrate our favourite pieces and artists. Join our first member’s exhibition which will celebrate the collection of artwork. 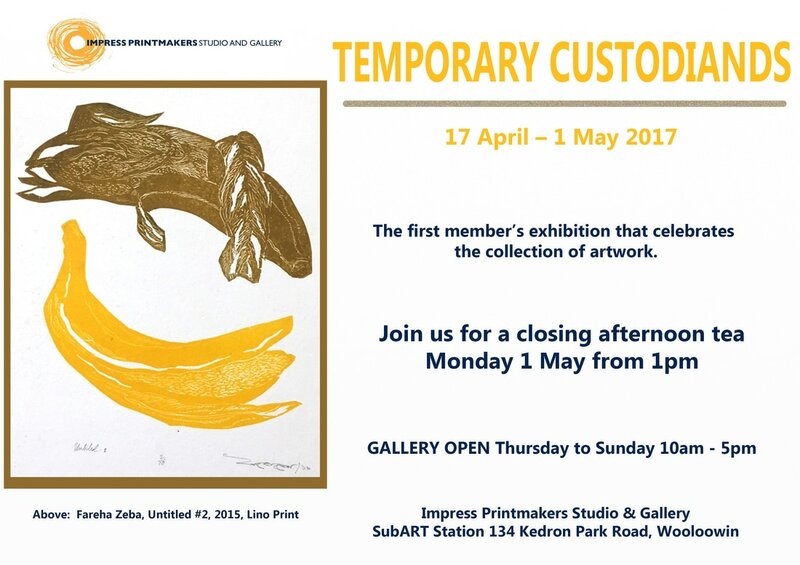 Undertake at least one task to help with show at Impress Gallery (unless you live outside the greater Brisbane region), and submit artwork as detailed on the form below. This is a free show and as such it is important that you help with at least one task on the check list. Works can include any medium but sculptures must be approved through email to nicola.garrett.artist@gmail.com. Also participants are to submit a jpeg (300 dpi, ~2MB) of the artwork submitted, and a quote about why you collected the artwork submitted (max. 100 words). LABEL WITH YOUR INITIAL AND SURNAME AND TITLE.